Selma Hembram, 68 hailing from Santhal tribe waited for 3 long years to regain her vision lost to cataract. Living in Sunderbans’ last hanging island, Patahar Pratima, separated by a deep forest and river, Selma did not have access to eye care facilities, but more importantly a qualified counsellor, who could address her fear of surgery. 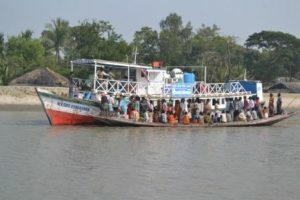 A large number of West Bangal’s Sunderbans islanders face a similar fate. For them local traditional medical practitioners are the first contact and in several areas, the only. Commonly known barriers of lack of adequate health centres, awareness and health seeking behaviour afflicted Sunderabans, a short 2 hour drive from the Kolkata, the capital of West Bengal. Some challenges however, are as distinctive to this island as its mangroves – geographical, communication, low population density, abject poverty and accessibility. The 52 inhabited islands of the total 106 are connected through rivulets, each rivulet the width of a river. Sightsavers had their task cut out for them when they launched their five year long ‘Eye Health Systems Strengthening Project’ from 2013 culminating in 2018. In a significant impact the blindness prevalence in Sundarbans was significantly reduced to 0.7% as per the project’s end-line survey. The ‘Eye Health Systems Strengthening Project’ aimed at addressing the urgent need for improving eye health in select blocks of North 24 Parganas and South 24 Parganas of Sunderbans Islands, West Bengal, India. The project was supported by Standard Chartered Bank as a part of their ‘Seeing is Believing’ campaign and was implemented in partnership with Southern Health Improvement Society-SHIS, Sundarbans Social Development Centre- SSDC and Vivekananda Mission Ashram-VMA) and the two district government hospitals. 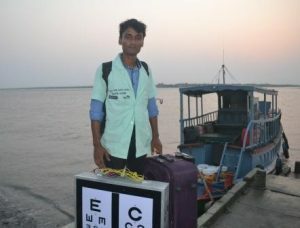 “The project adopted a two pronged approach, providing primary eye care services to the community through Vision Centres, and strengthening the eye health system in the Sundarbans through developing a cadre of eye health professionals from the community. Sightsavers also supported infrastructural improvements within existing primary and secondary health centres, both at the government and non-governmental levels,” Said Mr R N Mohanty, CEO, Sightsavers about the project. The project incorporated the provision of free corrective surgeries for specific categories, such as cataract cases among children and the elderly with financial difficulties in association the District Blindness Control Program. It provided access to affordable spectacles and supported school screening and referrals. Moreover, vision centres at the block level played a pivotal role in the project. Capacity building activities for personnel associated with the project as well as those working on eye health within the local public health systems were also undertaken. To a large extent, the objectives of the project have been achieved. As per the final project report, 392,117 adults were screened of whom 205,033 people refracted and 30,814 provided with cataract surgery; 448,617 school children screened and 7637 received free spectacles. Ninety nine (99) children with congenital cataract also received appropriate surgical intervention. To cater to the population in Sundarbans, the project has developed 17 vision centres housed at blocks with trained cadre to man. The core of every vision centre was based on the concept of sustainability which aimed towards generating enough revenue to be able to support the expenses like running cost of VC, salary of one VT and one community health worker. “It was a wonderful experience of team work with 3 partners along with Sightsavers. It was a cohesive unit and we all worked in a seamless manner,” was the lasting impression shared by Dr Asim Sil. Here is the story of an old couple, who lost their sight due to cataract and suffered life with vision loss for three long years. Years during which they lived alone and survived only due to their love for each other. What was needed was a simple surgery. This is the fate of the unreached in India who need not be blind. But fortunately there are organizations who are there to help. For Gafoor, 80 years old and Shahidhan, 75 love for each other was, perhaps, the only reason that gave them a motivation to live and face the dark drudgery of life with stoic silence. In their over 60 years of married life, the couple, living in rural Uttar Pradesh, had their share of ups and downs in life and it had more often than not been a struggle. But their love for each other was never put to the test more than in the last few years. A difficult life of surviving on daily wages earned by them became all the more challenging when they gradually started losing their sight. When their vision diminished further and they became blind, life became a nightmare for the old couple. They approached each day with trepidation. With their vision gone, each simple daily chore that earlier was simple, seemed insurmountable. Even moving around the house was a challenge. Menial tasks like cleaning, washing or going to the toilet started becoming impossible. With no children or relatives to help, for over three years the couple were dependent on the goodwill of the villagers who dropped in occasionally to feed or clean up the couple. Fortunately their fate took a turn towards sunshine as the Hospital Based Community Eye Health Project implemented by Operation Eyesight in collaboration with Dr. Jawahar Lal Rohatgi Eye Hospital in Kanpur District, Uttar Pradesh was God-send for the couple. During a door to door survey which was conducted in the project target area to identify those with eye problems and at risk of going blind, the Community Eye Health Workers were shocked to find the couple covered in filth. The Community Health Workers assessed the vision of the old couple and diagnosed them with being blind due to cataract in both the eyes. The couple were counseled to undergo surgery at the hospital free of cost to them. However, the couple who had supported each other morally for the past three years were apprehensive to leave each other alone for the fear that the other person may not be able to survive. They told the Community Eye Health Workers that they would rather die blind together than be separated. Nivedita, the Project Coordinator and Dr. Shivam Maini the Project In-charge and Ophthalmologist at the hospital visited the couple and assured them they both would be taken to the hospital and both would undergo surgery on the same day and brought back to their home together. Convinced, the couple consented and underwent surgery for one eye and after a month for their second eye. Post surgery they regained their vision. They are now very happy and self dependent. Gafoor can now take care of his wife well. Shahidhan is able to look after their house and even manage to cook food. They stated that that being blind although was a terrible nightmare, just being together helped them overcome their sorrow. And they readily agreed with Dr. Maini that the only thing that should be blind is love! T he 66th World Health Assembly (WHA) concluded on 27 May, 2013 with agreement on a range of new public health measures and recommendations aimed at securing greater health benefits for all people, everywhere. At the WHA “Towards universal eye health: a global action plan 2014-2019” – was endorsed by delegates. This is an action plan that aims to further improve eye health, reduce avoidable visual impairment and secure access to rehabilitation services. The global target is to reduce the prevalence of avoidable visual impairment by 25% by 2019. Mr Peter Ackland, CEO, International Agency for Prevention of Blindness ( IAPB) was at the WHA. We posed some questions to him to understand the global action plan better and what it means for India. Following is the text of the Q and A with Mr Peter Ackland. V 2020 India: The global action plan 2014-2019 towards universal eye health for all was endorsed during the recently concluded WHA. This is a big achievement for the eye care fraternity. Can you share with our readers the importance of the action plan, especially with year 2020 approaching? Peter Ackland: The new Global Action Plan (GAP) is now the most important strategic document that we have in the field of eye health at global level. It builds upon and replaces previous VISION 2020 and 2009 – 2013 Action Plans. It is important because it keeps eye health and the elimination of avoidable blindness and visual impairment on the radar of health policy makers. With so much current international interest in the Neglected Tropical Diseases and the four priority non-communicable diseases (cancer, respiratory diseases, heart diseases and diabetes) we have to fight for attention for our cause of better eye health.  V 2020 India: What are the unique features of this action plan? Peter Ackland: The GAP has an overall target – which is to reduce the prevalence of avoidable visual impair-ment by 25% by the year 2019 from the baseline of 2010. This is important as once achieved it will continue the downward trend we have seen in the age standardised prevalence rate of both blindness and moderate & severe visual impairment in the period 1990 to 2010. The first objective focuses upon generating evidence on the magnitude and causes of visual impairment and on the state of eye health services and using this evidence to advocate for greater political and financial commit-ment by national governments to eye health. Objective two encourages the development of policies, plans and programmes to enhance universal eye health. It refers to the need for integration of eye health into strengthened health systems. Objective three stress the need for multisectoral engagements and effective partnerships. Each objective has a number of proposed actions for national governments, the WHO Secretariat and Interna-tional Partners – IAPB and VISION 2020 India would fall into this latter group. Overall the GAP summarises well current thinking within IAPB and its’ Members as to how we are most likely to raise the profile of eye health, vision impairment and rehabilitation and establish the services required to bring eye health to the most marginalised and poorest groups in society. V 2020 India: Can you briefly describe the steps towards drafting the action plan and who all were involved in the entire exercise? Peter Ackland: The first important step was that made at the World Health Assembly Executive Board meeting of Jan 2012 when a decision was made to ask the WHO Secretariat to prepare a new Action Plan to succeed the 2009 -13 Action Plan. A few months prior to this meeting IAPB had established a work group to advocate to Member States represented on the Executive Board for a new Plan, so we were very happy with this outcome. The WHO then prepared a discussion document and invited stakeholders to express their views as to what should be included in the new Action Plan. IAPB and many of our Members responded to this online consulta-tion. At the World Health Assembly in May 2012 the Australian delegation and IAPB hosted a lunch time semi-nar which was very well attended. By June, WHO had posted a “zero draft” of the new Action Plan and estab-lished a web-based consultation process. By September the “First draft” had been prepared followed by two a web-based consultation process. By September the “First draft” had been prepared followed by two meetings in October where Member States and NGOs in official relations with WHO, including IAPB, were able to comment on the content and the targets. The penultimate draft was then prepared for the Executive Board meeting of January 2013 where it was heartily endorsed and recommended for adoption. This subsequently happened at the WHA in May 2013. Overall the consensus has been that the process was genuinely consultative, that views and comments were taken on board throughout the process, and that the final draft adopted at the WHA was very good content wise. V 2020 India: The preparation involved several stakeholders. Were there any challenges that you faced while the proposal was being drafted? Peter Ackland: The key challenge was to ensure that the process to develop and promote the new GAP was driven by Member States. WHO has over the past couple of years been engaged in a reform process that has stressed that the WHO is accountable to the 194 Member States and not to civil society or private sector interests. Thus it would have been counter-productive if IAPB had been seen to be at the forefront. Accordingly our advocacy strategy was to build relationships with Member States and encourage them to promote the GAP at the meetings. At this point I should pay tribute to the work of Lesley Podesta, the Chair of the IAPB work group, and Sanjeev Commar, a consultant engaged to help with the work in Geneva – both know the WHO system very well and their political antennae meant we were able to get the balance right. At the IAPB 9th General Assembly in Hyderabad in September 2012 VISION 2020 India arranged for us to meet senior Indian government officials and we were able to talk about the new GAP. Likewise we met the high level Chinese delegation that attended the 9GA. Getting the support of these countries and the leadership displayed by Australia, Mexico and Saudi Arabia in particular was the key to success. V 2020 India: You in your blog have mentioned that now it is time for implementation. So what are the next steps? And how will this plan be implemented universally? Peter Ackland: Important though the new GAP is it will only add value if it is now taken up seriously at country levels and national governments take responsibility for implementing the GAP in their country. Future IAPB advo-cacy work will now shift to country level – though we would hope all countries will take action the reality is that if we are to make impact on the global prevalence of blindness and visual impairment some big countries just have to succeed. Very obviously India would be amongst those important target countries where we must see real progress. To this end we are lucky to have VISION 2020 India that is already well established in-country, plus a positive relationship with the government and many eye health leaders and champions. The development of eye health already in-cluded in the 12th National five year plan of India already lay a good foundation for implementing aspects of the new GAP. Unfortunately in many other countries these coalitions and plans to promote eye health are less well es-tablished. Part of IAPB’s future role will be to help establish strong local capacity to advocate for change. We have been discussing with WHO how we can catalyse local interest in the new GAP. One thing we have thought of is to encourage the development of an approved WHO eye health service assessment tool which can be used in each country as a situational analysis of current provision and identify areas that need strengthening. Another proven approach has been to encourage localised prevalence surveys, such as RAABs. Global data or even national level data in big countries like India, can easily seem distant to policy makers and politicians whilst a local survey that identifies the size and causes of blindness and visual impairment is harder to ignore and more likely to interest people to want to do something about the situation. V 2020 India: Vision 2020 India participated toward preparing the draft proposal along with other Vision 2020 programmes. What role do you think all the Vision 2020 programmes around the world can play to take this for-ward? What are the steps that they can take to successfully implement this action plan? Peter Ackland: Local advocacy to promote national implementation of the new GAP is the key to success. The national VISION 2020 bodies are perfectly placed to be the organisations that lead the advocacy in their country. To a large extent advocacy work is very locally based – it is about knowing how political and policy decisions are made and who the key people are to build relationships with and to seek to influence. Much of this is culturally specific. There is no way that this can be led from outside the country. Though IAPB can share resources and promote learning useful for advocacy based upon experiences of VISION 2020 organisations across different countries, ultimately it is local action that will win the day for us. These are exciting times and the new GAP provides us with the opportunity to make a lasting impact – I hope everyone reading this will feel they have something to offer to make this all happen – because you all do! V 2020 India: Thank you Mr Ackland. V 2020 – India: Why a survey on Trachoma? Dr Praveen Vashist: According to the World Health Organisation (WHO) India is one of the endemic coun-tries for Trachoma. The last national survey was done in 1986 – 89. It is more than 25 years, a period in which a number of socio-developmental and trachoma specific SAFE initiatives have been taken to reduce the burden of the disease. It is time to conduct a mega survey to assess how these initiatives have impacted and to find out the current preva-lence and magnitude of trachoma in the country. V 2020 – India: Has the disease not been eliminated from the country? Dr Praveen Vashist: Though the burden of disease is reduced but there are still some high risk areas for trachoma. Dr RP Centre did a sur-vey in Nicobar Island of Andaman and Nicobar Island in 2010 and nearly 50% children were identified with active trachoma infection and trachomatous trichiasis was also ob-served in adults in all the ten villages surveyed, wherein trachoma control measures were suggested in form of mass Azithromycin treatment once in a year for three consecutive years. We conducted a repeat survey after three years in 2013 and found that the prevalence of active infection has come down to 6.8% amongst the surveyed children.In our Rapid Assessment of Trachoma (RAT) in urban slums of Delhi, we found active cases of trachoma in few slums although the magnitude of active trachoma infection was low. V 2020 – India: For the current survey which are the states that you have selected? Dr Praveen Vashist: We are conducting the tra-choma prevalence survey in 9 districts of 5 states which were part of the previous TRA survey in 2006 – 07. The 5 states are: Punjab, Haryana, Rajasthan, Gu-jarat and Uttarakhand. Uttar Pradesh was part of the 2006 – 07 survey, but Trachoma prevalence study has already been conducted by NPCB in this state. Hoshiarpur (Punjab), Mahendergarh & Mewat (Haryana), Bikaner, Dholpur & Tonk(Rajasthan), Pauri Garhwal (Uttaranchal), and Kutch & Banas-kanta (Gujarat). Additionally, 15 districts in 15 states will also be covered where a rapid as-sessment of trachoma will reflect the current status of trachoma in these regions. V 2020 – India: What is the sam-pling frame/size for the survey? trichiasis, corneal opacity including blindness. V 2020 – India: Dr Praveen, you have led several surveys, including the one on trachoma in Andaman and Nicobar. So drawing from that experience what do you bring different to this survey? Dr Praveen Vashist: In one word: quality. We are concerned about quality and are making all efforts to ensure that we maintain standards as per WHO guide-lines. We are also conducting microbiological investi-gations among the cases as well as equal number of controls. Direct Immunofluorescence analysis will be done using the MicroTrak Chlamydia trachomatis Specimen Kit procured from M/s Trinity Biotech, IreDirect Specimen Kit procured from M/s Trinity Biotech, Ireland in the dedicated trachoma lab of ocular microbiol-ogy unit of Dr. R.P.Centre.